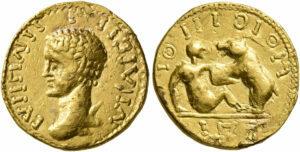 Lot 677: Macrinus, 217-218. Sestertius, Summer 217-early 218, Rome. Very rare. About extremely fine. From a Viennese Collection. Estimate: 5,000 CHF. Zurich-based auction house Leu Numismatik will be holding their Auction 4 on 25 May 2019. This is by far Leu’s largest room sale to date featuring 925 lots from the fields of ancient, medieval and modern numismatics. Alongside many important individual pieces, several collections which have been put together over the course of many years will be on offer. Among these is the collection of Dr. P. Vogl, who for more than 30 years has been collecting coins from the Roman provinces of Asia Minor. Many of his coins are not only of outstanding quality and rarity, but they were also acquired at important Munich auctions of the 1980s and 1990s and therefore boast valuable provenances. In addition the collection of Mr. S. Pozzi will be on sale. While his collection does not include coins of great rarity, it does include bronze and silver issues of high quality and exceptionally good style. Both collections are characterized by meticulously kept documentation: In many cases, the original coin tickets and additional records made it possible to precisely reconstruct the time and place that the coins were acquired. Lot 204: Macedon. Olynthos. Tetradrachm, ca. 479-475/0 B. C. Very rare. Nearly extremely fine. From a Viennese Collection. Estimate: 10,000 CHF. A very special highlight is an old Viennese collection, which has been preserved for three generations and is now being put back on the market after more than 70 years. Born in the 1930s, the grandfather of the current owner assembled this important collection of Greek and Roman coins in gold, silver and bronze in the 50s and 60s of the previous century. Lot 392: Kyrenaika. Kyrene. Tetradrachm, ca. 435-331 B. C. Very rare. Good very fine. From a Viennese Collection. Estimate: 15,000 CHF. 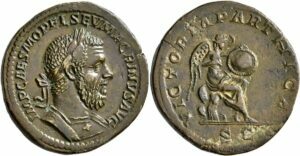 Particularly noteworthy are the outstanding tetradrachms from Olynthos (lot 204) and Kyrene (lot 392) as well as the rare and untouched sestertii of Macrinus (lot 677) and Gordianus II Africanus (lot 698). 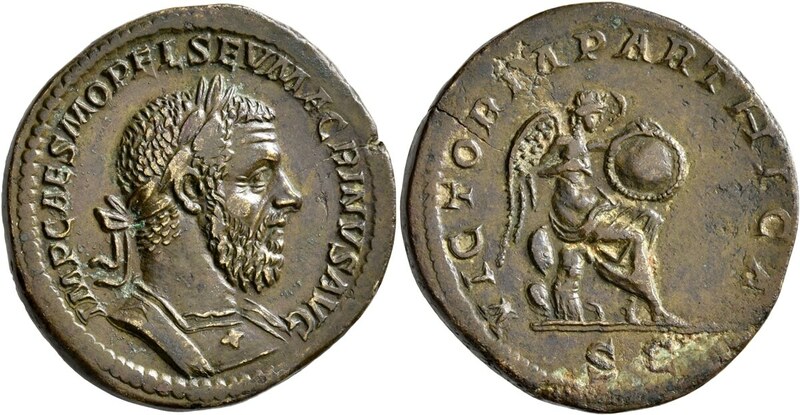 Lot 358: Kings of Armenia. Mithradates, Satrap of Armenia, ca. 180s-170s B. C. Honorary medal of brooch. Unpublished and unique. Very minor marks, otherwise, good very fine. From a collection of important Armenian coins. Estimate: 30,000 CHF. In addition, there will be collections with a focus on particular time periods and regions: The ‘Keltika Collection’ comprises Celtic coins from the Gallic and the Danube regions. The ‘Massalia Collection’ contains some extremely rare and highly interesting Archaic coins from the Greek city of Massalia. The Armenian coins form one of the most important groups of this epoch to have been auctioned to date. The highlight of this collection is undoubtedly a gold honorary medal or brooch of an Armenian satrap, Mithradates I (lot 358), who was hitherto only known from a few bronze coins. Lot 823: Uncertain Germanic tribes. Pseudo-imperial coinage. “Quinarius”. Mid 3rd/early 4th centuries. About extremely fine. From the “Aurum Barbarorum Collection”. Estimate: 2,500 CHF. 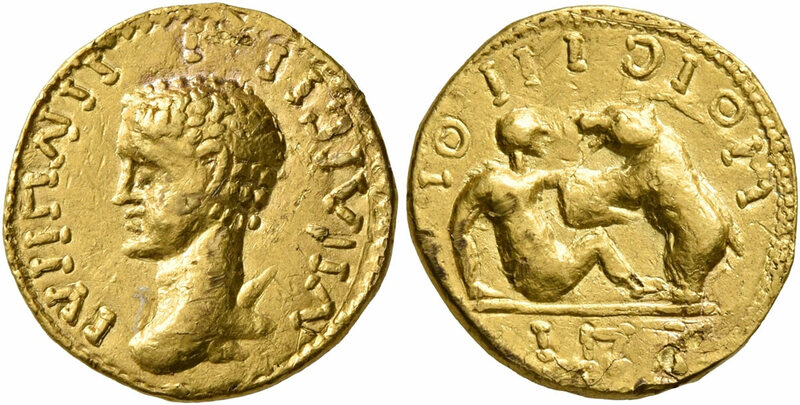 Finally, the ‘Aurum Barbarorum Collection’ is undoubtedly the largest and most scientifically significant private collection of Germanic imitations of Roman gold coins to be auctioned to date. No less than 54 coins from this catalogue were previously completely unknown to science and are hence probably unique. You can browse throught the complete auction catalogue on the website of Leu Numismatik. There you will find further information on this and forthcoming auctions.